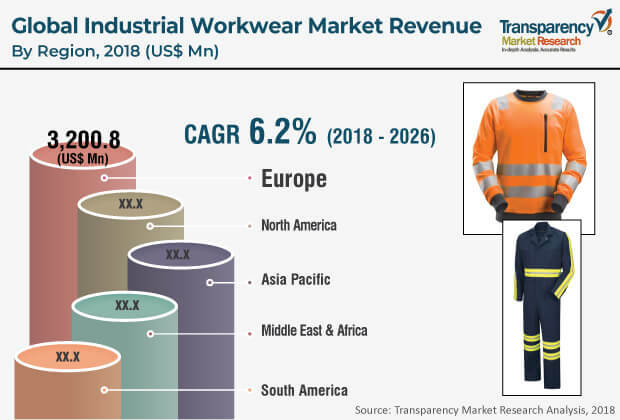 According to a new market report published by Transparency Market Research titled “Industrial Workwear Market [Product Type– Top wear, Bottom wear, Coveralls; End-use Industry – Oil & Gas, Construction, Manufacturing, Automotive, Chemical, Others (Food Processing, Mining etc. ); Fit Type – Men, Women, Unisex; Distribution Channel-Online Distribution Channel, Offline Distribution Channel]– Global Industry Analysis, Size, Share, Growth, Trends, and Forecast, 2018 – 2026,” the global industrial workwear market is expected to reach a value of US$ 15,060.8 Mn by 2026. The market is estimated to expand at a CAGR of 6.5% during the forecast period from 2018 to 2026. In terms of volume, the market stood at around 173.4 million units in 2017. Europe dominated the industrial workwear market in 2017 by acquiring market share of approximately 34%. The market in the region witnessed considerable growth due to enforcement of stringent policies for workplace safety. Furthermore, the region is the hub of many global players for industrial workwear. In addition, continuous product innovation by key manufacturers as a result of intense competition from competitors has resulted in industrial workwear of premium quality at a competitive price. The industrial workwear market is influenced by market dynamics with the prime driving factor being the increasing demand for safe and durable workwear due to increasing workplace accidents globally. Additionally, increasing working population coupled with rise in working women’s population across various industries globally has been one of the growth drivers for the industrial workwear market. However, variation in enforcement of stringent policies regarding workplace safety across various countries is one of the major drawbacks of the market. Spreading awareness regarding usage of industrial workwear is a growth opportunity for boosting the industrial workwear market. Additionally, advent of e-commerce sites for procurement of industrial workwear is also anticipated to proliferate the industrial workwear market. Based on product type, the top wear segment dominated the market in 2017 and was valued at US$ 4,251.2 Mn at a CAGR of 6.8%. The segment dominated the market due to increasing demand for top wear clothing. Rising demand for top wear that can be used both as functional and casual wear has been one of the reasons for the growth of the top wear segment. Additionally, a wide product mix under the top wear segment used across various industries has been another key reason for the growing demand for top wear.In terms of end-use industry,manufacturing industry dominated the market in 2017 due to presence of more workforce in the industry globally, coupled with enforcement of stringent policies regarding workplace safety regulations. Based on fit type, men’s segment dominated the market due to presence of more male workforce compared to female workforce globally across various industries. Offline distribution channel is still a preferred mode of distribution for supply of industrial workwear. Specialist distributors and super stockists who supply industrial workwear to end consumers are prevalent in the industrial workwear supply chain. By region, Asia Pacific is anticipated to be a lucrative market due to emergence of new industrial workwear manufacturers along with China being the manufacturing hub of industrial workwear. Some of the key players in the industrial workwear market include 3M, VF Corporation, Ansell Ltd., Honeywell International Ltd., E. I. du Pont de Nemours and Company, Williamson-Dickie Manufacturing Co., Hultafors Group, Lakeland Inc., Aramark, and Fristads Kansas Group. The players adopt numerous strategies to sustain in the market. Product development, acquisition, and partnership are some of the key strategies adopted by them to gain a competitive edge.